Hello everyone and happy Friday! Today I'm going to stray a little from my usual weekly update post. I've decided that I would like to start going more in depth about certain eventful days in my life, and here is the first one. 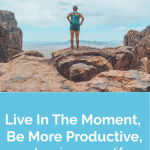 Yes, I am a personal finance blogger, but life isn't all about money, and yes, you can enjoy life while still being responsible with money. Recently, I published the post 8 Things To Stop Being Afraid Of So You Can Be Rich, Happy, And Successful. Well, one of my big fears lately has been a fear of heights, mainly related to rock climbing. As most of you know, around one month ago I started indoor rock climbing. Rock climbing is something I’ve always wanted to do, but I'm THAT person who is terrified of falling to my death. Because of this, I’ve always been a little hesitant. I don’t know what it is about rock climbing that makes me more afraid of falling than other things. I have no problem with airplanes, and when I was younger my dad used to rent airplanes and fly us around in small planes with just me and him in them. I also don’t have a fear of roller coasters, and I have jumped off an archway with just a bungee cord attached to me. However, my fear of rock climbing is extreme. I am a rather clumsy person, and I always thought that would hold me back when it came to rock climbing. Deciding to go somewhere to overcome my fear. Since this is something I have always wanted to overcome, I have been throwing myself into the rock climbing world. For our first real outdoor rock climbing experience, we decided we would get a climbing guide. 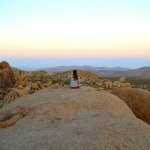 We went on a last second road trip and decided to head out to Joshua Tree National Park. Joshua Tree is supposed to be a great rock climbing spot, so we knew we couldn’t go wrong. 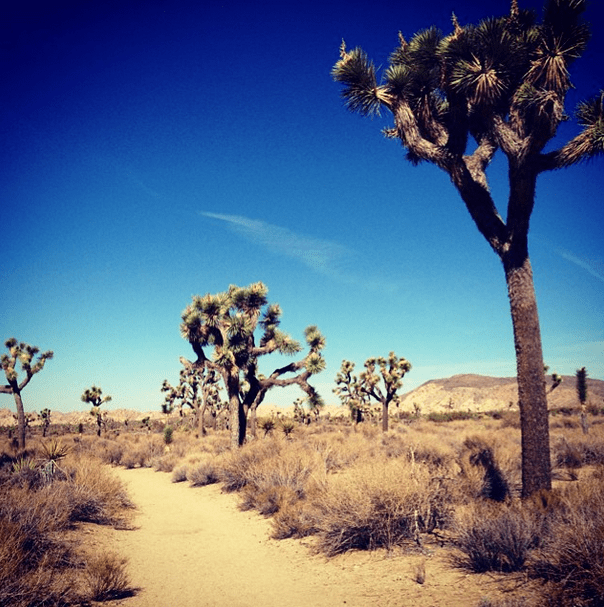 We then searched for a Joshua Tree rock climbing guide (we chose that one!) and decided to use one so that we could safely climb since we are beginners. I want to share a little information about Cliffhanger Guides in case you are interested in trying them out as well. After all, you are putting your life in their hands so me just telling you to use them on your next trip doesn’t make much sense (no, this is not an affiliate or sponsored post). It also would be hard for me to explain my rock climbing day without talking about our guide and how he helped me, so a background on them is probably best so that you don't think I just went rock climbing with some random person we found wondering around in the national park. We also loved our experience with Cliffhanger Guides, so I figured I would give them a little blog love since it was such a great experience. 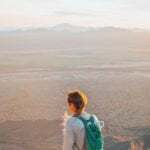 Hopefully if any of you travel to Joshua Tree and need a rock climbing guide you will look into Cliffhanger Guides as well. 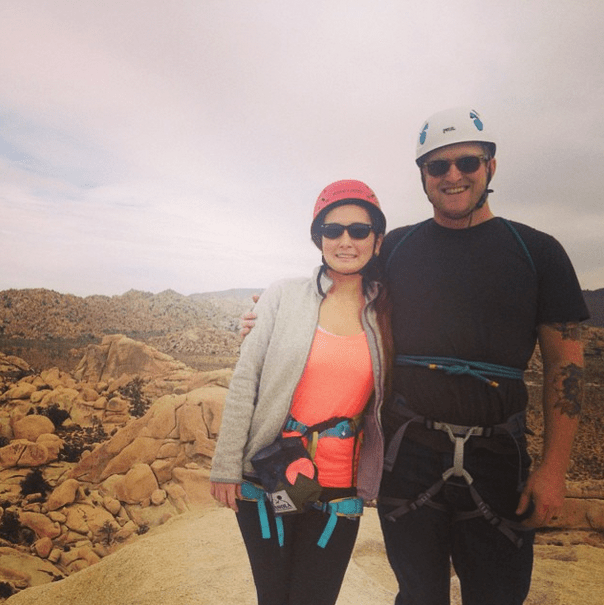 I do not think there are any other Joshua Tree rock climbing guides that are better than them. Background on who we chose for our Joshua Tree rock climbing guide. 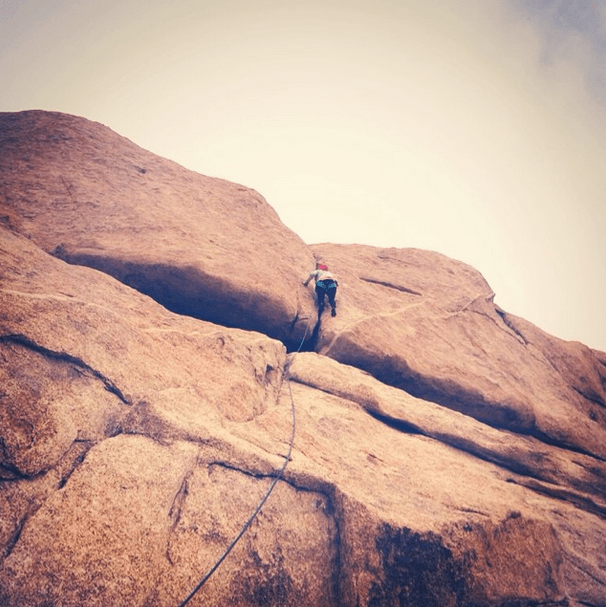 Cliffhanger Guides is a rock climbing guide service that provides guided trips in Joshua Tree National Park. 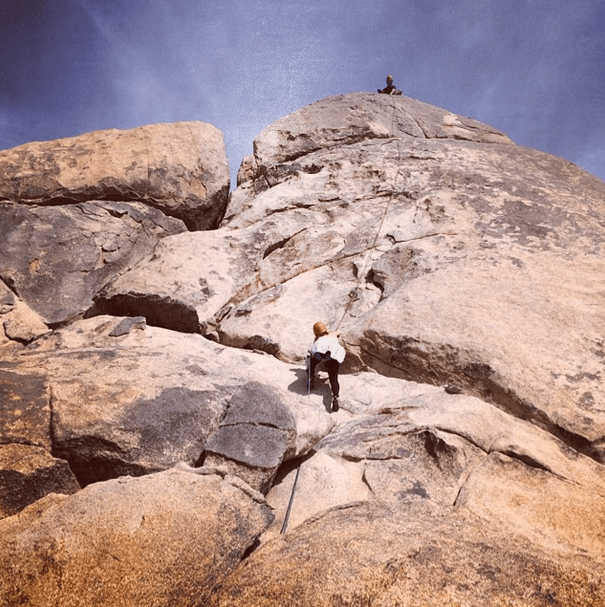 I searched several other Joshua Tree rock climbing guide services but Cliffhanger Guides had the BEST reviews hands down. Every review I read was a 5 star review in which everyone said they had the best time of their life. And that wasn't a lie. It WAS the best time of my life. More on that below. Cliffhanger Guides is certified by the Professional Climbing Guides Institute. 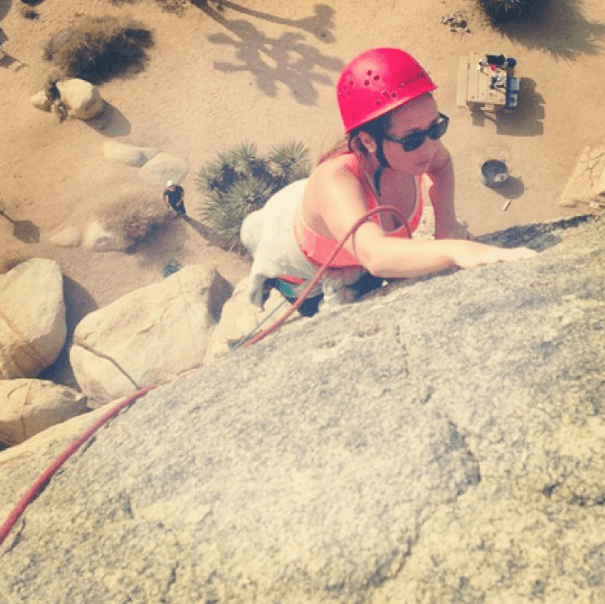 They also are legally permitted and insured to provide rock climbing guided trips in Joshua Tree National Park. You WANT to make sure your climbing guide is certified. We have a climbing instructor back home in St. Louis and he said to make sure the person is certified because there are “guides” out there who are not certified or professionally trained at all. You are putting your life in their hands so 5 minutes of extra research will not hurt you. Our Joshua Tree rock climbing guide was Seth (him and his lovely wife own Cliffhanger Guides). From the moment we met him we knew we were going to have a fun time. He is very friendly and you can tell he knows what he’s doing. 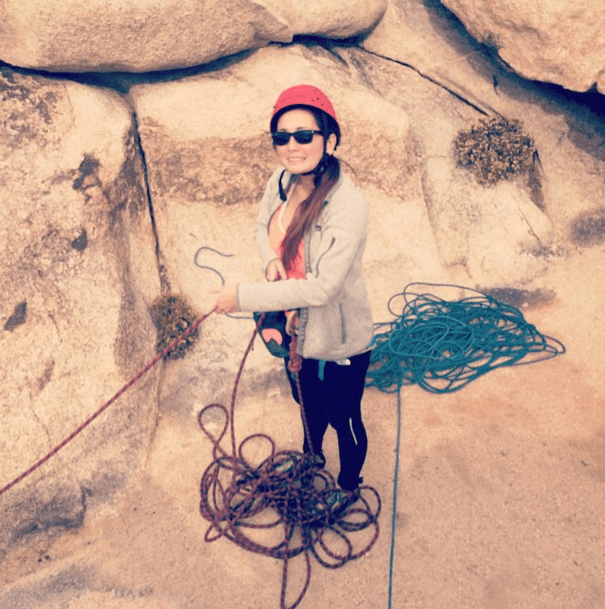 My first rock climbing experience outside with a Joshua Tree rock climbing guide. Seth made our experience very enjoyable and memorable. He knew I was a little afraid of heights, and he made sure I was always comfortable with what we were doing. For our first climb, we did a multi-pitch route, with the first pitch being somewhat simple so that I could get used to how high up we were. For the second pitch we went straight up, and boy was that scary and fun at the same time. Seth never made me feel unsafe, and I think this is why getting an experienced rock climbing guide is EXTREMELY important. Before we went to our next climb, we had lunch. Cliffhanger Guides provides lunch, which I don’t think many other guide services do. Actually I don’t think any do. I once went on a hiking guided session a few years ago where they claimed they provided lunch, and instead I got a protein bar. I was STARVING by the time I was done. The lunch they provided was very delicious. There were fresh vegetables, roasted vegetables, hummus, an assorted tray of delicious cheeses, dried mango, crackers, prosciutto, sparkling lemon water, and caramel cookies that melted in your mouth. Nothing about this meal was cheap, and that could clearly be seen. 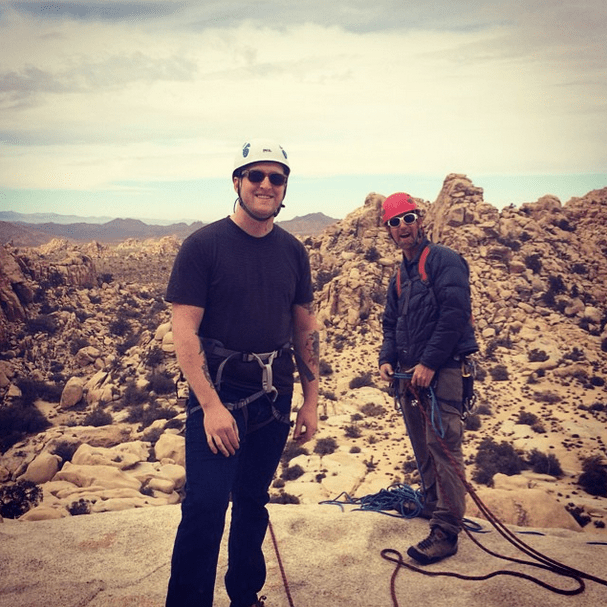 Everything was top notch and I could tell that Cliffhanger Guides spends their time to make sure that the whole Joshua Tree rock climbing experience was amazing. I’m a big foodie so of course my mouth is watering right now. For our other climb, Seth decided to up what we were doing. The first climb was so that he could test us and understand our skill level. The second climb was a little scary when I stepped back to look at it, knowing that we were climbing straight up. However, Seth always made me feel very safe and always let me know that he had me on the rope and that I was secure. I remember climbing up this one and wondering what the heck I had gotten myself into. However, I knew I didn't want to back out, so I continued going up it. I've never felt more accomplished than I did when I finally pulled myself to the top! For all the routes, I climbed them successfully and I was extremely happy with my rock climbing day. I probably fist pumped 100 times that day just because of how proud I was to overcome my fear of outdoor climbing. Having Seth as our guide let me be able to enjoy our trip much more. I knew that he knew what he was doing, and I knew he was an expert. This made everything so much more fun and not as nerve-wrecking for me since I knew I had someone there to make sure everything was done correctly. I am so incredibly happy that I was able to get over my fear of rock climbing outdoors. We are pretty much planning all of our future trips around rock climbing, and I have dreams of one day being able to climb at Yosemite. That will probably take a looooong time (a VERY LONG TIME), but I know I would like to do it one day. Is rock climbing something that interests you? What goal are you working towards? Is it related to money, travel, a fear, career, etc.? This is me in the picture! Awesome! You look like badass in those photos! I think I’ve told you before that I definitely have a fear of rock climbing heights. I’m fine with hiking, but sometimes I get nervous when we’re summiting a particularly rocky peak. I’m really not sure if I could ever go climbing, but, it’s awesome that you’ve conquered your fears. What a beautiful setting to do it in, too! I’m the same way. When I’m summiting a rocky peak and there is a gust of wind – I tend to freak out! Michelle, you are brave! I would be terrified! Go you! Congrats on conquering your fear!!!!!! I was scared to death when I first repelled. The guy was like, “Lean horizontal when you go down and everything will be fine.” As I began my descent, I was like, “What if I need to stand up half way down?’ His response, ‘Then you’ll fall.’ He was joking but I thought he was seriously. It was terrifying. Haha yeah I know what you mean. It is scary! You looked awesome climbing up there! I really enjoyed when I would do indoor rock climbing too, my forearms were always so sore afterwards, I must have been doing something wrong! I’d like to scale a mountain one day, it’ll be interesting to see which one it ends up being! Good job conquering your fears! WOW!!! This is so cool, Michelle! This looks pretty awesome, not something I have ever really thought about, but Joshua Tree is so close so now I want to try it! Yes, you should definitely try it out! It was a lot of fun. Haha yeah I’m glad I tried it. I’m addicted now! What a great trip. Looks terrifying to me. But more power to you!! Haha it was a lot of fun! I hate rock climbing! I’ve tried it a few times, but I have horrible technique (which I KNOW is horrible but I can’t make myself lighten up on my arms), and then I get tired out quickly and everything goes to sh*t. So, I applaud you for conquering your fear and gettin’ it done! Haha thanks Anne! That stinks that you didn’t like it. I love it! Your experience looks so cool though, I’m inspired to try rock climbing again (with safety gear and a knowledgeable guide this time). Congrats on conquering your fear! Yes having a good guide means everything. You should do it one day! 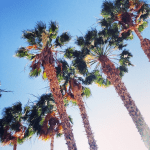 You’re in California!!! I love that you are randomly taking road trips. Nice way to enjoy being self-employed. I went to an indoor rock gym and tried to get over my fear of heights and I nearly had a panic attack. I was in the kids section and these 5 year olds were doing better than me. It was quite embarrassing. I don’t know how you got over your fear so quickly. I still need to work on mine! Haha yeah I started with the kids side at the climbing gym as well. So embaressing! We go indoor climbing occasionally and that’s always challenging fun, but I can’t see myself ever doing it out in the wild 🙂 Go you! Haha you should try it one time. It’s a ton of fun! Way to go Michelle! I’ve never even been to JT and I’ve been in Cali just over 10 years! But I don’t climb, and I don’t like camping very much either. lol! Glad you challenged your fear head on! Haha you should go! 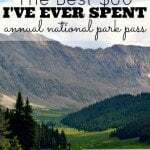 It’s great for hiking as well. I’d be way too scared to try something like this, but good for you!! Awesome stuff!! I too am afraid of heights. I remember watching a 60 Minutes piece on a guy that did some serious rock climbing without safety ropes. I was sweating just watching him from my couch!! I’m not sure I’m ready to conquer my fear of heights through rock climbing, but I have been flying more, which is helping me a little bit. Yup that guy is crazy! Wes was climbing the other day and someone zipped passed him without any rope or harness. Crazy! I have never been real rock climbing either, but always wanted to go, hope to one day, the only rock climbing I have done is on a indoor one, what a adventure! Love the pictures!